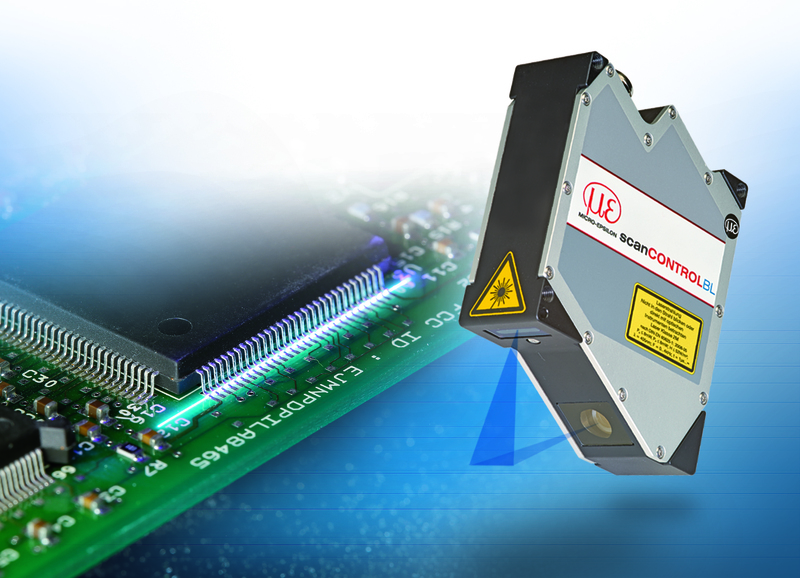 Equipped with a blue-violet laser diode, the scanCONTROL 29xx-10/BL laser profile scanner provides an effective measuring range of just 10mm with a profile resolution of 1280 points. This results in a point distance of just 7.8µm, which enables the laser profile scanner to provide twice the resolution of previous laser scanners with a 25mm measuring range. The blue laser line used can be projected significantly more sharply than the red one. While allowing higher stability, the blue laser light does not penetrate the measurement object due to the shorter wavelength of the blue-violet laser. As with existing laser profile scanners from Micro-Epsilon, the entire electronics is housed in a compact sensor body, where the signal processing takes place, which eliminates the need for an external controller. They detect, measure and evaluate the profiles on different object surfaces. The 29xx-10/BL modes is due to its short laser line used e.g. in monitoring tasks in the electronics production where the precise measurement of smallest components is critical, e.g. with the automatic inspection of plug pins. In this way, coplanarity and distance between the single pins can be inspected during the production process. Via different interfaces (e.g. Ethernet UDP, Modbus TCP and RTU, RS422…), these measurement values are transmitted to the control system, which can remove any defective parts from the production process for rework, thus avoiding costly repairs in downstream processes.